People always associate barbecues with summer – but for this season of Mastercook we decided to break the habit and get our candidates stuck in winter grilling! What’s so great about winter barbecues is that you can play with warming winter flavours. So, for my winter BBQ recipe I’ve decided to use classic winter ingredients: prunes, brussels sprouts and bacon. If you wonder what the hell I mean with devils on horseback – they’re in fact bacon-wrapped prunes, which I’ve used in my pork skewers. They work really well on the barbecue and make winter grilling a total treat. Wash the new potatoes and put them on a sheet of foil. Crush a garlic clove with your hand (by just pushing hard on it, so that it bursts), keep it in its skin and snuggle the garlic clove in between the potatoes. Sprinkle some rosemary needles and salt over the potatoes, put the piece of butter between the potatoes and wrap into a tight parcel. Put the potato parcel on the hot barbecue, close the lid and grill for 25 minutes. Meanwhile, wash the Brussels sprouts, trim and cut in halves. Put the Brussels sprouts into a bowl, drizzle with a tablespoon of olive oil and season with salt. Put the Brussels sprouts on a sheet of foil, so that they’re in one layer. Close the foil so that you get a parcel, set aside until later. In a small bowl, mix the crème fraiche with the parsley and ¼ tsp salt and pepper. Refrigerate until needed. 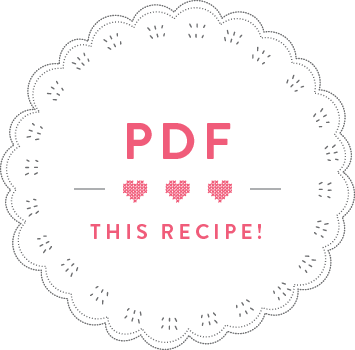 For the skewers: cut the pork chops into cubes and put into a bowl. Season with the chopped rosemary, olive oil, ¼ tsp salt and pepper. Cut the pancetta rashers into long slices and wrap them around the prunes. Thread 4 pork cubes and 5 wrapped prunes onto each skewers, alternating between them. Once the potatoes have been on the barbecue for 25 minutes, lift the lid and flip the potato parcel (they need to continue to grill for 15 minutes). 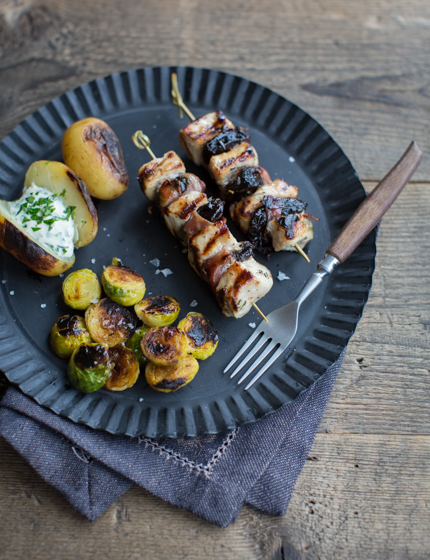 Put the parcel with the Brussels sprouts and the skewers onto the barbecue next to the potato parcel, and grill for 15 minutes, turning the skewers from time to time. After 5 minutes, flip the Brussels sprouts parcel, so that they cook from the other side. After another 5 minutes, flip the parcel again, open and pour in the balsamic vinegar. Close the parcel and cook for another 5 minutes. After 15 minutes, the potatoes should be cooked through and the pork skewers done. 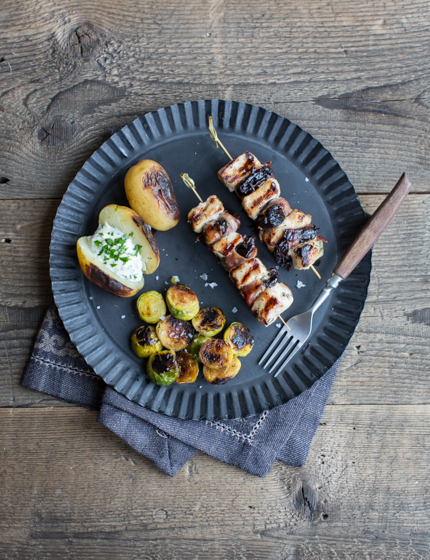 Distribute the pork skewers and Brussels sprouts between two plates, and serve the potatoes with a dollop of crème fraiche.